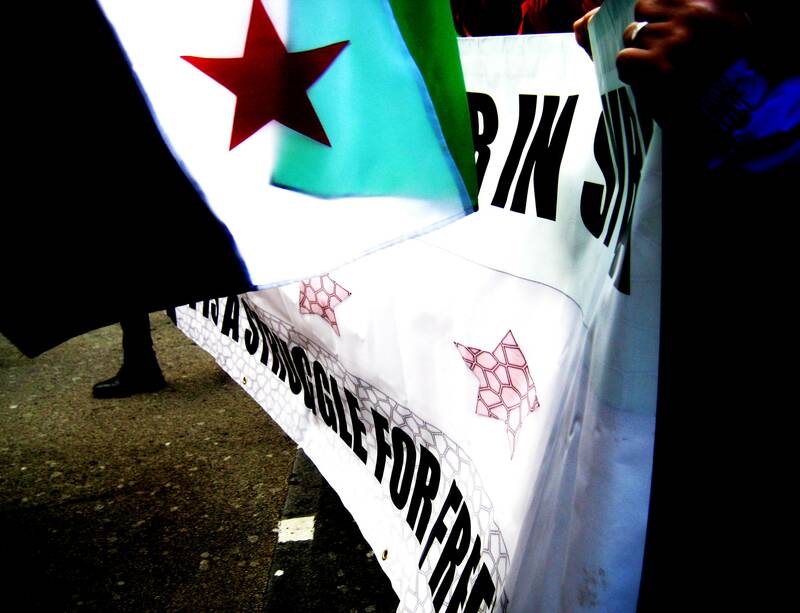 I am delighted to announce a commission for my project Reverberations of Conflict, Syrian Voices in London‏. This entails a programme of events I am orchestrating that will offer a critical platform for exchange and multiple-perspectives for Syrians based in London who are touched and affected by the crisis taking place in Syria. At this first stage, this includes a roundtable exchange on 27th April 2015 and a visual art workshop on 13th May 2015 as well as a series of audio and video recordings I’ll be conducting with interviewees. How do we describe trauma of those who experience the conflict from abroad? The political process has not been nourished by a deeper human understanding of this conflict. This is a project focusing on individuals- different generational and gendered perspectives bringing together Syrian students, families, individuals and related groups from across London. I am interested in exploring and sharing points of lived experience and personal narratives of ongoing Syrian civil war of Syrians living here in UK and to provide informed voices, too often marginalised by the media or government bias. Through an initial informal discussion, video works and visual art workshop and potentially a public exhibition by the artist based on any audio/video interviews conducted and/or the works produced during the workshop- this may be exhibited to the public in context to raise awareness of such experiences. I’ll also be working with Professor Michael Kerr and Professor Aaron Rosen, bios below. With thanks to Kings College London and 3FF who have funded this project. Director of the Middle East & Mediterranean Studies programme and the Centre for the Study of Divided Societies, and Professor of Conflict Studies. He is a graduate of Essex University (BA Hons Political Science), and the London School of Economics (MSc Government; PhD International History) where he was Leverhulme Research Fellow in 2007-08. He is the author of five books on regulating political conflict in Lebanon and Northern Ireland. His latest books The Destructors: The Story of Northern Ireland’s Lost Peace Process was published by Irish Academic Press in 2011 and Lebanon: After the Cedar Revolution (with Are Knudsen) with Hurst & Co in 2012. He is particularly concerned with power-sharing and third party intervention in divided societies, civil war, and peace processes, particularly with reference to Lebanon, Syria and Iran and will provide expert and active knowledge, network links and connections for the fruition of this project. Dr. Aaron Rosen current research focuses on interfaith dialogue and the visual arts. He examined related issues in his first book, Imagining Jewish Art (Legenda, 2009) as well as his forthcoming books, Art and Religion in the 21st Century(Thames and Hudson, 2015) and The Hospitality of Images: Art and Interfaith dialogue (in progress). He has done a variety of work on creative projects, from heading a steering committee for a new multi-faith space in London to curating a series of intercultural, crowd-sourced exhibitions at the Jewish Museum London. He is a regular commentator on these issues in the media. He will bring experience in facilitating dialogue, chairing public debates about conflict, and presenting results to the wider public. He will provide Joyce with advice about interviews, as well as contacts with KCL students with relatives in Syria. Kai-Oi Joyce Yung is a socially engaged practice which has at its core outreach and participation across diverse communities. Her award-winning commissions and exhibitions have dealt with conflict and social change from Hong Kong to Libya, with The Whitechapel Gallery, the British Council, South London Gallery, Tate, Istanbul Biennial, and Hong Kong University. She has had solo exhibitions at major venues ranging from Grundy Art Gallery to Cornerhouse. One of her primary skills is in part to bring together unlikely collaborative parties to forge inventive and thought-provoking interdisciplinary platforms. Her collaborations include marine biologists, psychologists, Steven Speilberg’s scriptwriter, academics, taxi drivers, former Alcatraz inmates, engineers and dancers. Her recent Arts Council England (ACE) funded research and development award and project across South America involved researching belief and conflict and sacred rituals. Previous involvement with interfaith dialogue include projects exploring the Holocaust through her EU funded Munich residency Constructions-Connections, and a Whitechapel Gallery project called The Mosque. Her ability to catalyse perceptive dialogue and new interactive sensory works fosters public interrelations towards tolerance and understanding. It is demonstrated through her British Council residency to Libya, whilst Happy Stacking with Grizedale Arts deployed her use of arts as a means to broker negotiation and problem solve in response to complex speed of urban renewal and segregated communities in China.